Imagine your journey into work worrying about what you might find when you arrive or whether your office might be violently stormed with you in it. 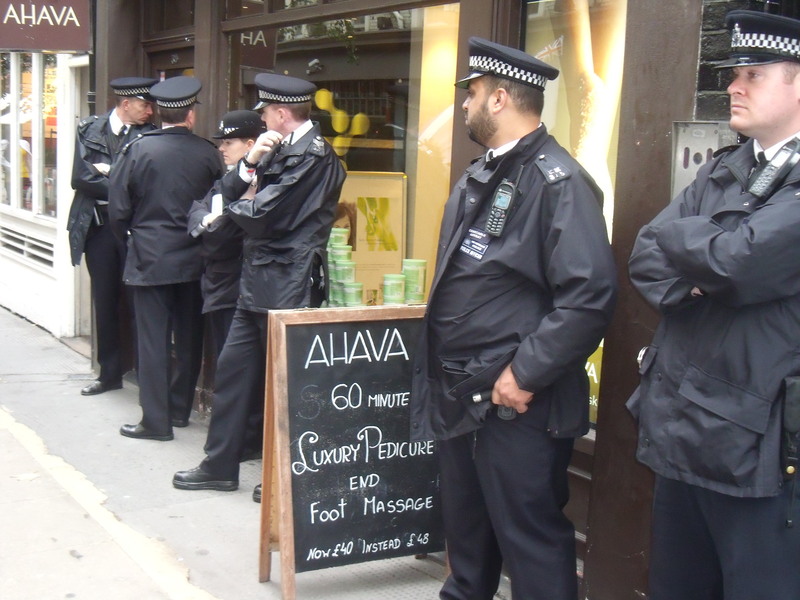 This is the daily fate of the Ahava staff who work in the shop on Monmouth Street in London’s Covent Garden. 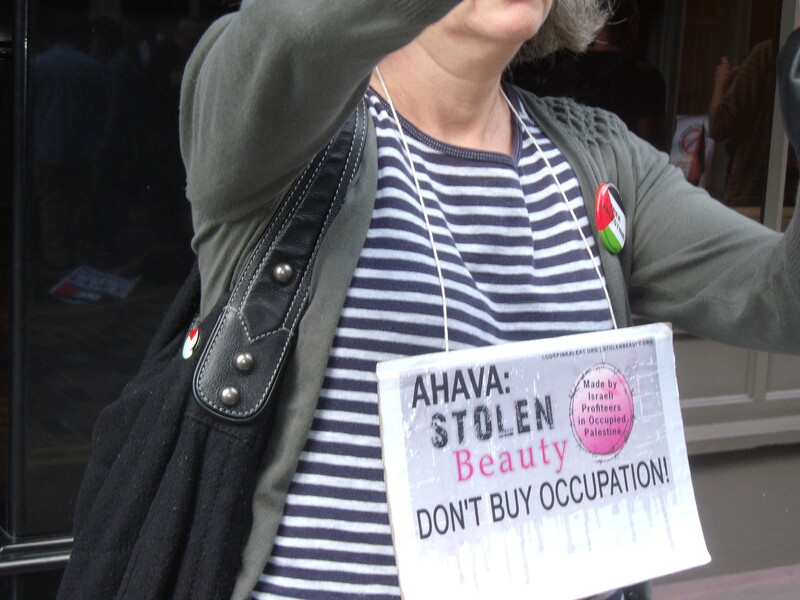 As we all know by now Ahava lost two days of business when late last year the shop was invaded by activists who locked themselves inside while petrified staff looked on. Then last week the shop front was coated in red paint by a couple of “brave” souls who had covered their faces so as not to be picked out by CCTV. 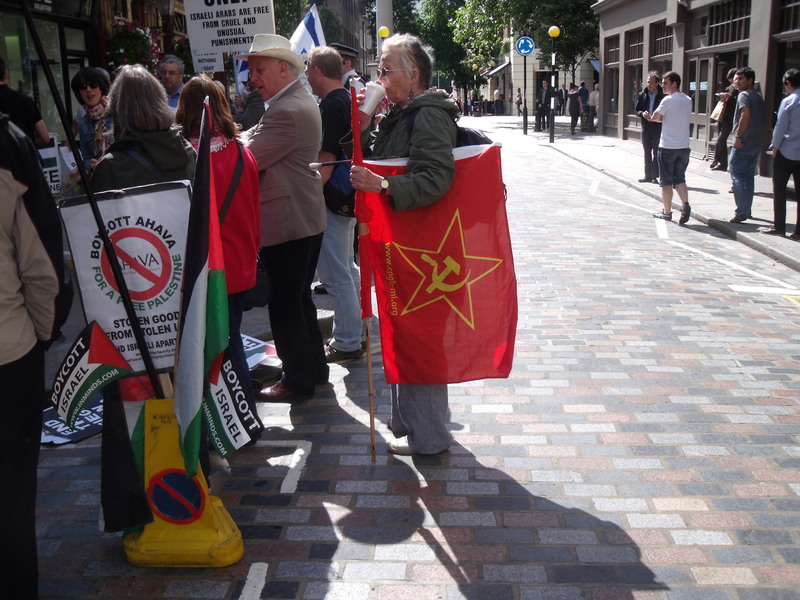 Yesterday the usual mob of anti-Israel activists turned up en masse with an array of Palestinian and Communist flags and the usual “Boycott Israel” and “Free Palestine” paraphernalia. 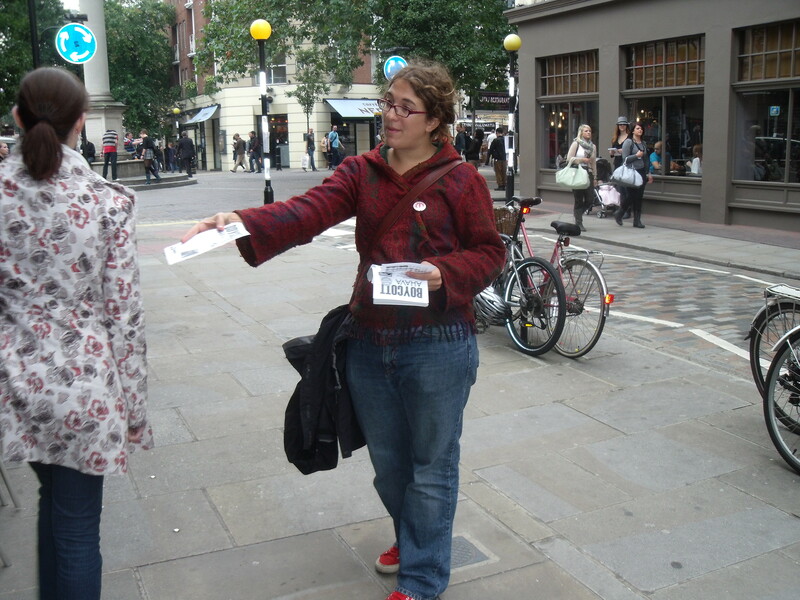 They were allowed to position themselves a couple of metres from Ahava’s shop door and hand out anti-Israel leaflets to passers-by. 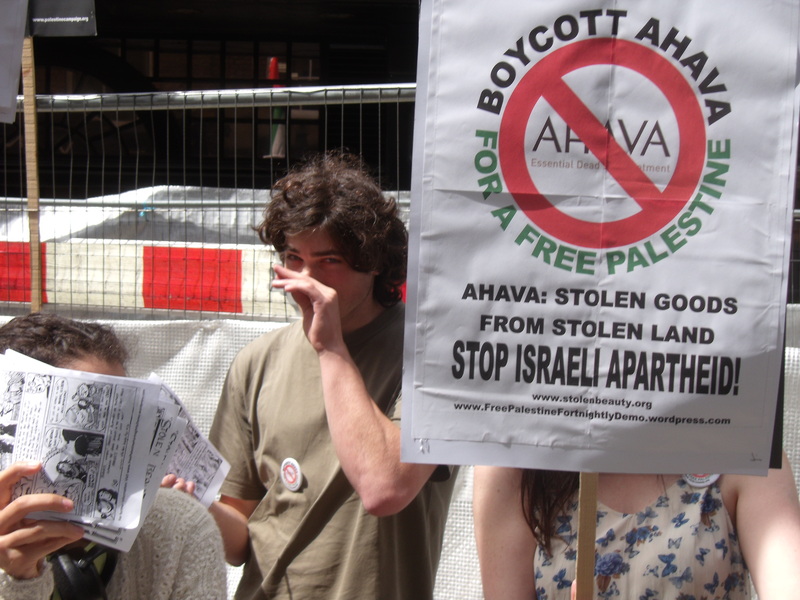 Sadly, one can forget any solidarity from neighbouring shop-keepers for now; Ahava is being told by some to shut up shop and go online. 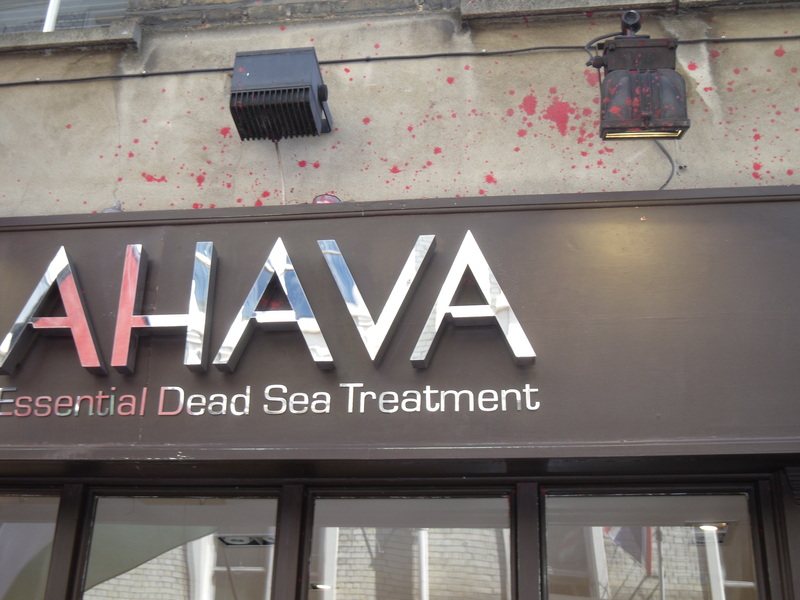 By yesterday the red paint had been mostly removed at great expense to Ahava. Remnants could still be seen above the shop. No chance of any of that money making it to the starving or malaria-ridden of Africa then, nor the the flood victims in Pakistan nor even to the Palestinians themselves who the activists claim to care so much about. Meanwhile, here is Channel 10 of Israel’s interesting video clip about the boycott Israel movement. Look out for insightful comment from Lauren Booth. 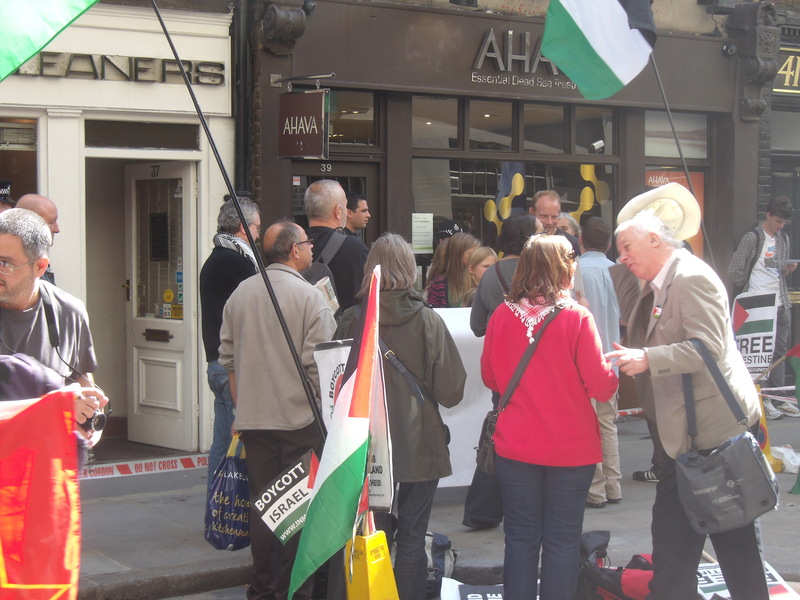 On Saturday some 80 anti-Israel protesters and 15 pro-Israel counter-demontrators crowded in front of Ahava in Covent Garden. For the first hour there was actually quite a good atmosphere as a small band showed up which played a medley of old Communist tunes including The Internationale,which they duly murdered. After an hour the atmosphere turned more menacing. 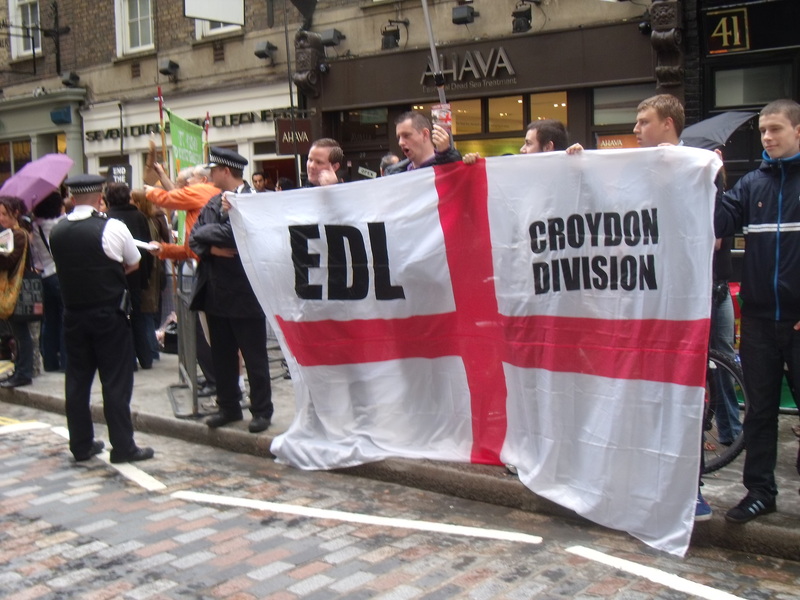 The Croydon Division of the the English Defence League (EDL) pitched up and unfurled a Flag of St. George, which acted as a lighting rod for the anti-Israel protesters. 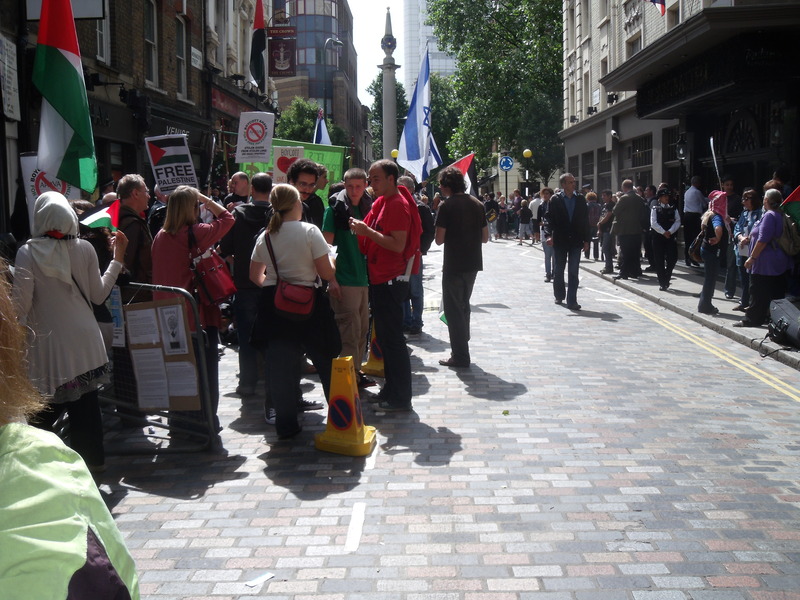 For the next hour the EDL group and anti-Israel protesters faced off and exchanged insults. 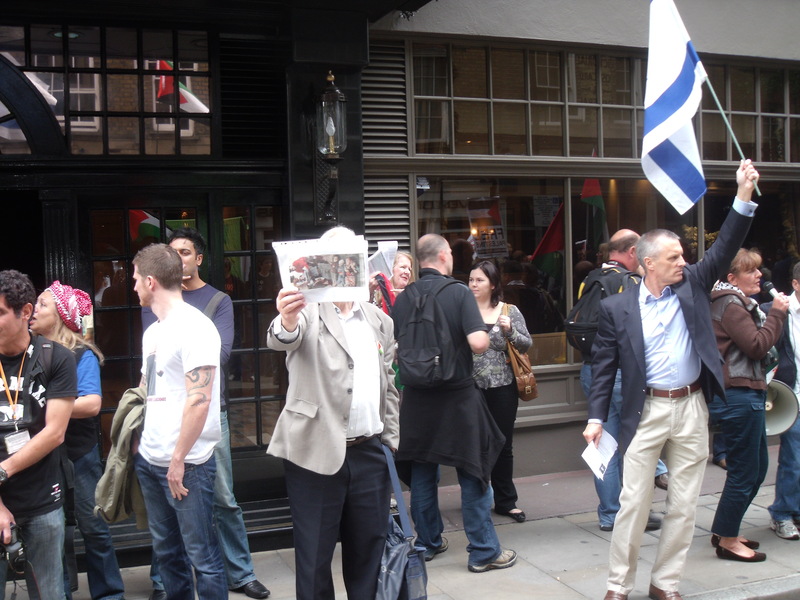 The usual accusations of EDL collusion with the “Zionists” are now being made in an attempt to smear as racist those who support Israel’s right to exist. Of course there was no collusion. In Britain you cannot stop anyone turning up, standing where they want, wearing what they want and saying what they want. You can only make complaints, of which there were many. I understand that at the next anti-Israel Ahava protest on 28th August the possibility of yet another pen, for the EDL, is being investigated. Not that anyone sticks to their pens anyway. 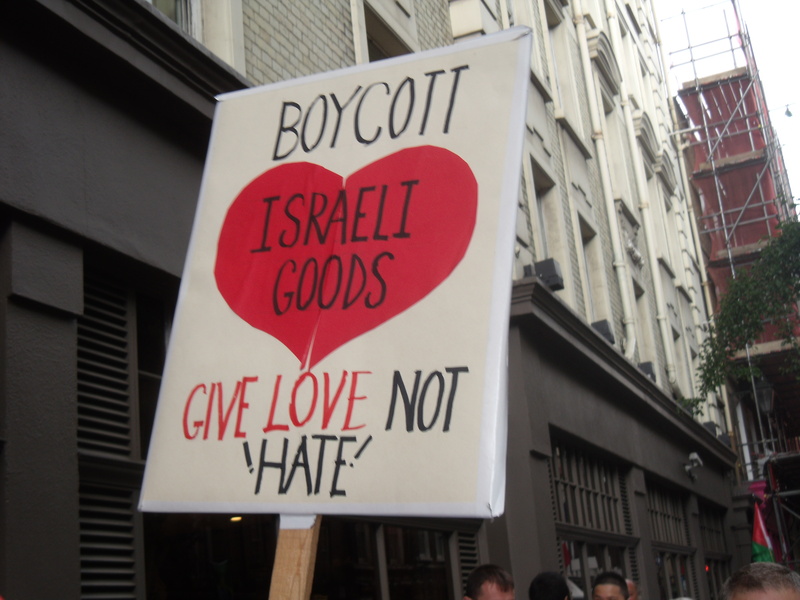 That said it is of the utmost hypocricy to make claims of racism while at the same time calling for a wordwide boycott of Israeli goods and people and more to the point Jewish Israeli ones (anything Christian or Muslim Israeli is exempt from boycott). 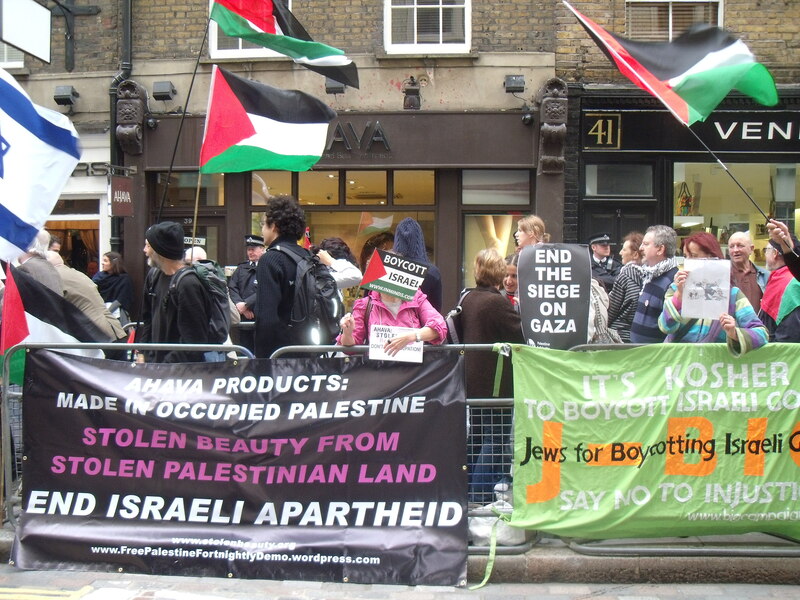 Apart from the anti-Israel Ahava protests there is also the continuing anti-Israeli demonstration outside Marks and Spencer every thursday night from 6 to 8pm. But Monmouth Street is very narrow. There is no room for almost 100 protesters antagonistic towards each other especially with cars constantly sweeping through and protesters all over the road. And on the 28th the crowds will likely be even bigger with the EDL there. Something for the police to sort out before something goes drastically wrong. 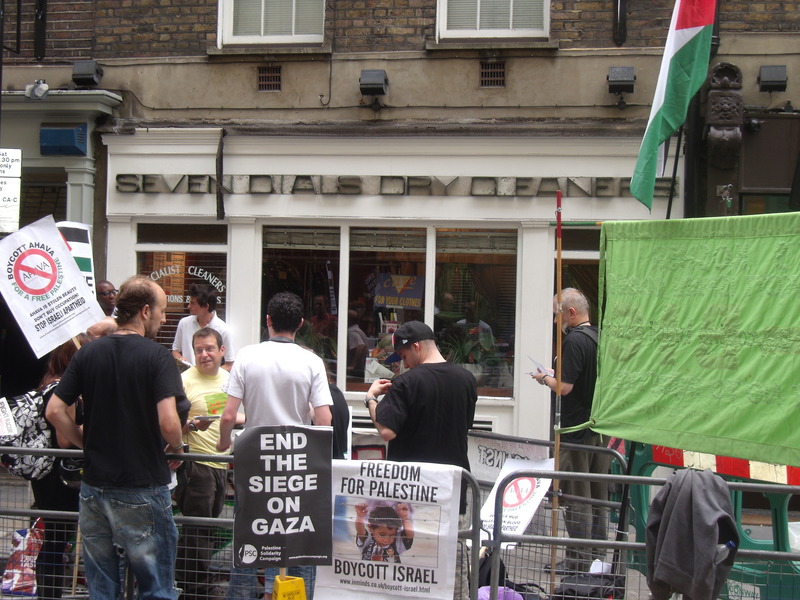 Four anti-Israel activists were today cleared at Highbury Corner Magistrates Court of all charges after they locked themselves onto concrete-filled oil drums inside the Israeli-owned Ahava shop on Monmouth Street in London’s Covent Garden forcing it to close down for one day in September 2009 and another day in December 2009. 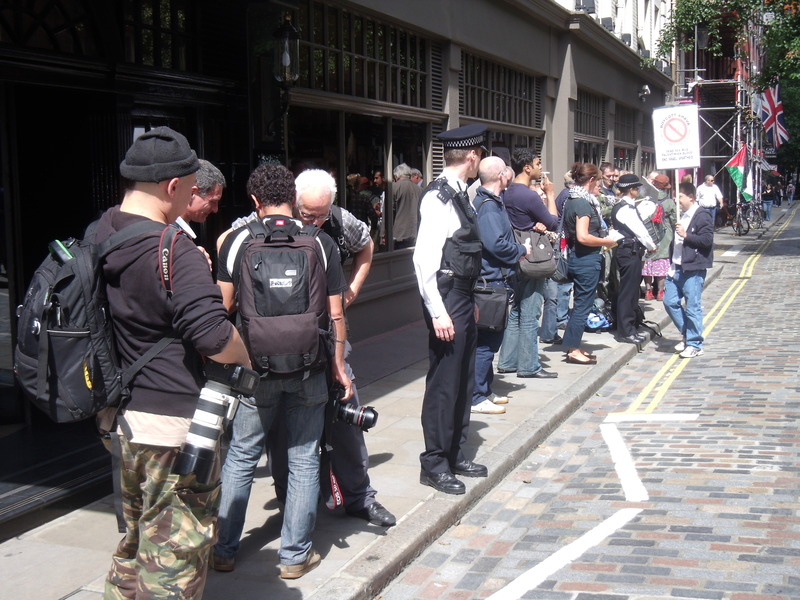 Taherali Gulamhussein, Bruce Levy, Tom Ellis and Ms Crouch, all from London, were found not guilty of failing to comply with a police officer’s orders to leave the shop (Ss.68&69 Criminal Justice and Public Order Act 1994). 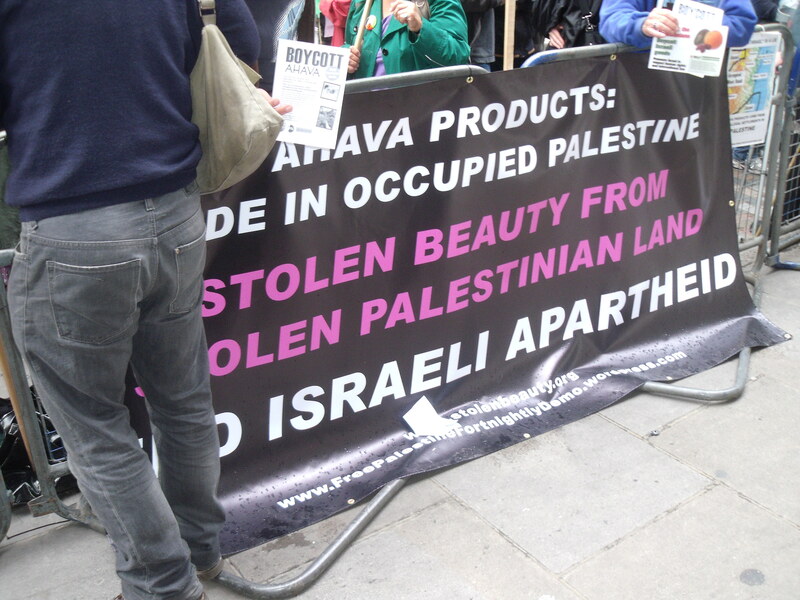 The activists insisted that they were legally justified in their actions as they claim the shop’s activities are illegal because the products on sale in the shop originate from Mitzpe Shalem, an Israeli settlement on the West Bank, and are deliberately mislabeled as “Made in Israel”. The website of the International Solidarity Movement states that on the first day of trial, prosecutors dropped aggravated trespass charges. This would have required the prosecution to demonstrate Ahava was engaged in lawful activity but, apparently, the CPS decided that this was not something they would attempt to prove. And, according to the website, the Ahava store’s manager’s failure to testify contributed to the acquittals on all remaining charges. 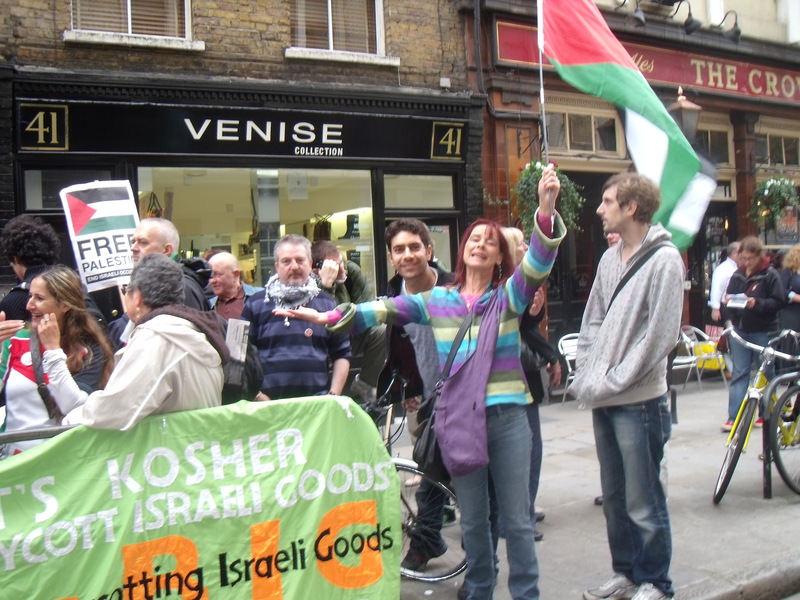 “The Government considers that traders would be misleading consumers and would therefore almost be certainly committing an offence, if they were to declare produce from the OPT (including from the West Bank) as ‘Produce of Israel’. This would apply irrespective of whether the produce was from a Palestinian producer or from an Israeli settlement in the OPT. This is because the area does not fall within the internationally recognised borders of the state of Israel” (11 December 2009). The activists were therefore found to have acted lawfully. This case comes after last month’s case at Hove Crown Court when seven anti-war activists were cleared of all charges after breaking into the EDO arms equipment factory in Brighton and causing £200,000 worth of damage. In that case the defendants claimed they were trying to prevent the factory from making arms for Israel during Operation Cast Lead in Gaza. But in his directions before dismissing them to consider a verdict Judge George Bathurst-Norman told the jury: “”You may think that hell on earth would not be an understatement of what the Gazans suffered at that time” and said of group leader Christopher Osmond: “The jury may feel his efforts investigating the company merit the George Cross.” The Crown Prosecution Service may still investigate these directions. 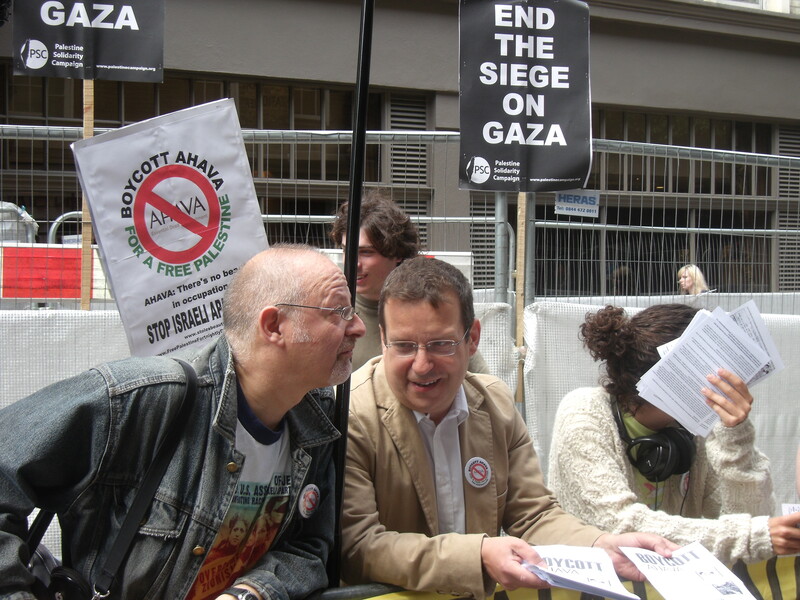 Numbers for next Saturday’s anti-Israel protest outside Ahava on Monmouth Street in Covent Garden from midday until 2pm are certain to be swelled after yet another triumph for anti-Israel activists in the UK. 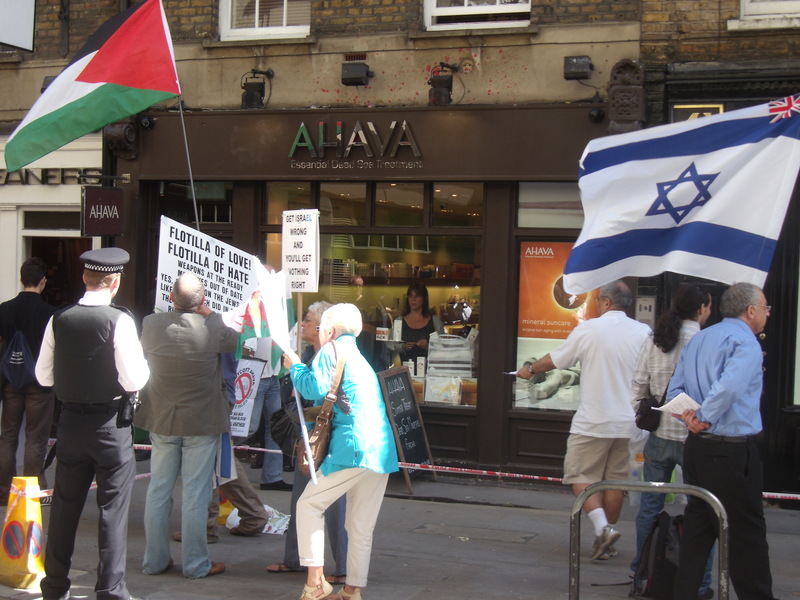 (Another recent anti-Israel protest outside Ahava). 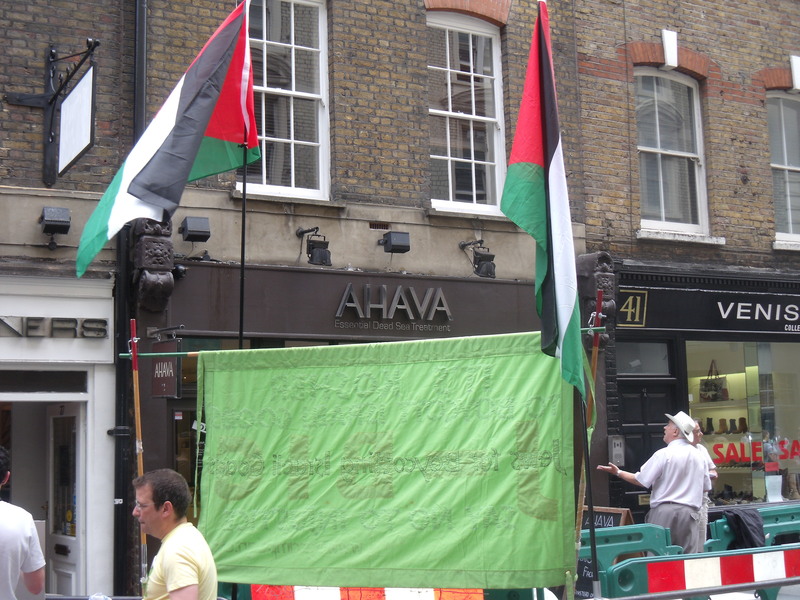 Around 30 anti-Israel protesters stood outside Ahava’s Covent Garden shop on saturday taunting Ahava’s shoppers with repeated cries of “Shame on you” during the Palestine Solidarity Campaign sponsored fortnightly protest against the Jewish state. 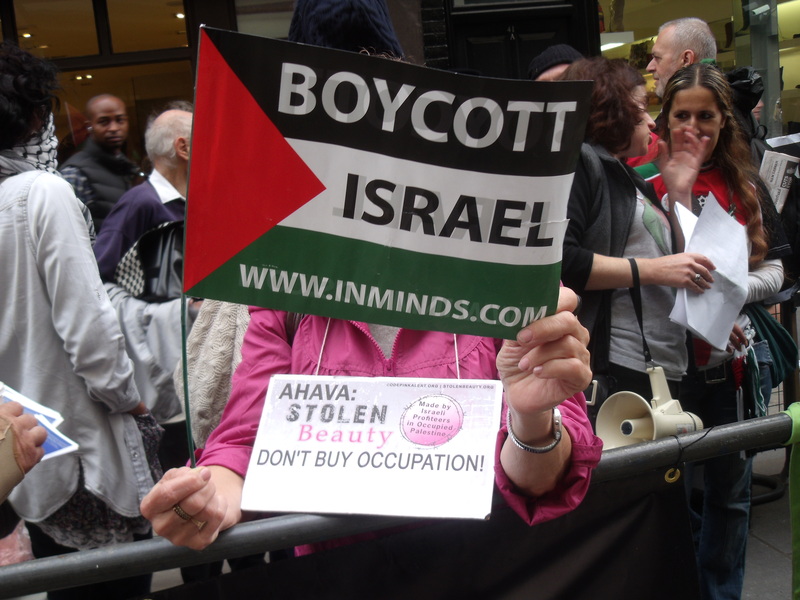 The usual “Boycott Ahava” placards were supplemented by “Free Gaza” ones, which gives lie to the claim that this is just an anti-Ahava protest. 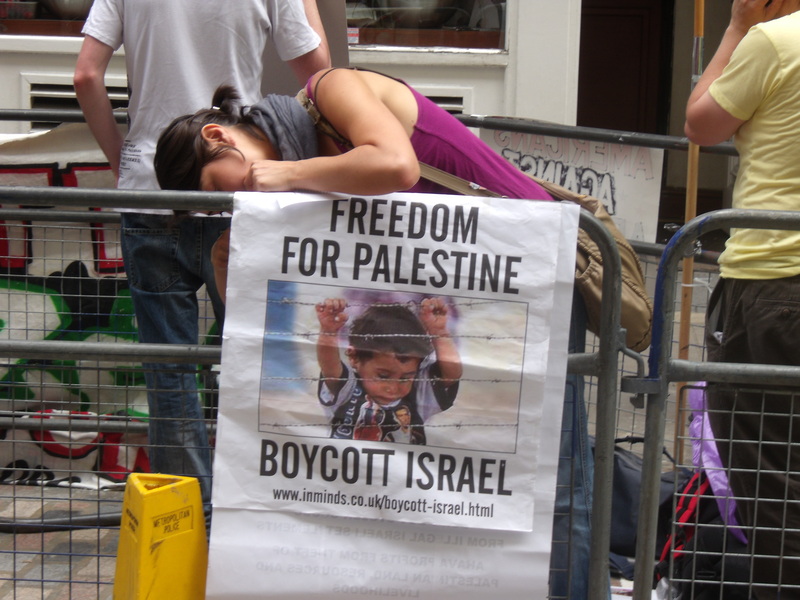 It is one of the many protests in this country that discriminate against just one country; Israel. 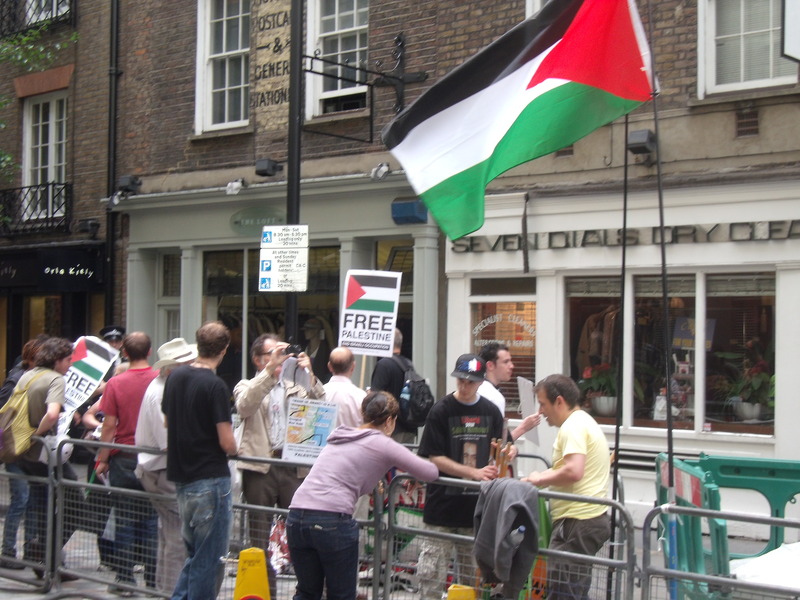 In addition, the protesters continuously called for the ending of Israel; the anthem “From the River to the sea, Palestine will be free”, was sung over and over again. 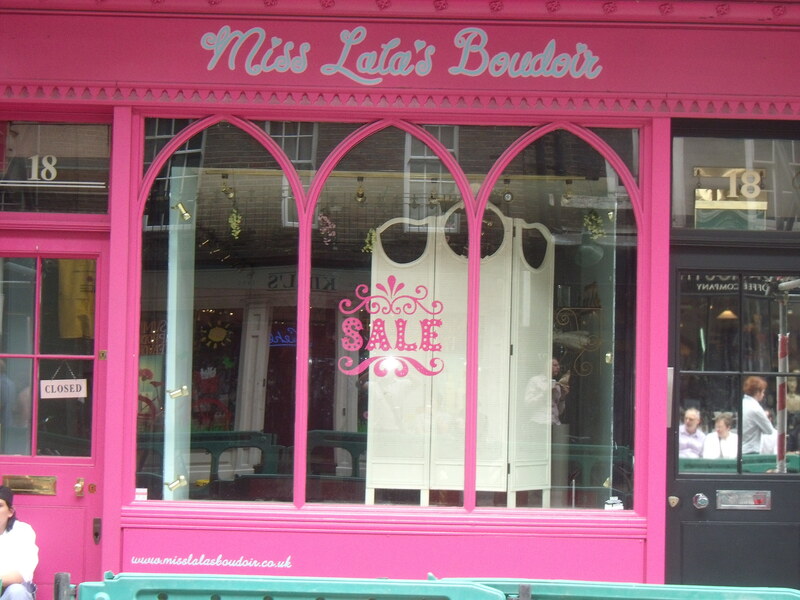 The surrounding shops are suffering and the manager of The Loft told me how the shop opposite to his, Miss Lala’s Boudoir, had closed down due to the disruptive anti-Israel protests. He was also very concerned for his own business, a secondhand designer clothes shop where you can buy and sell the likes of Paul Smith, Joseph, Jimmy Choo, Prada, D&G etc. 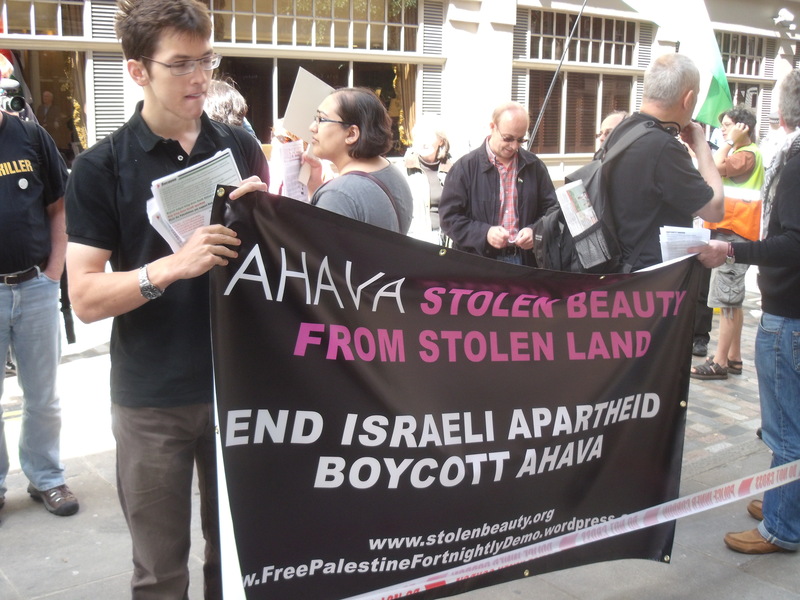 All shoppers coming and going from the Ahava shop were booed and taunted with a chorus of “shame on you”. 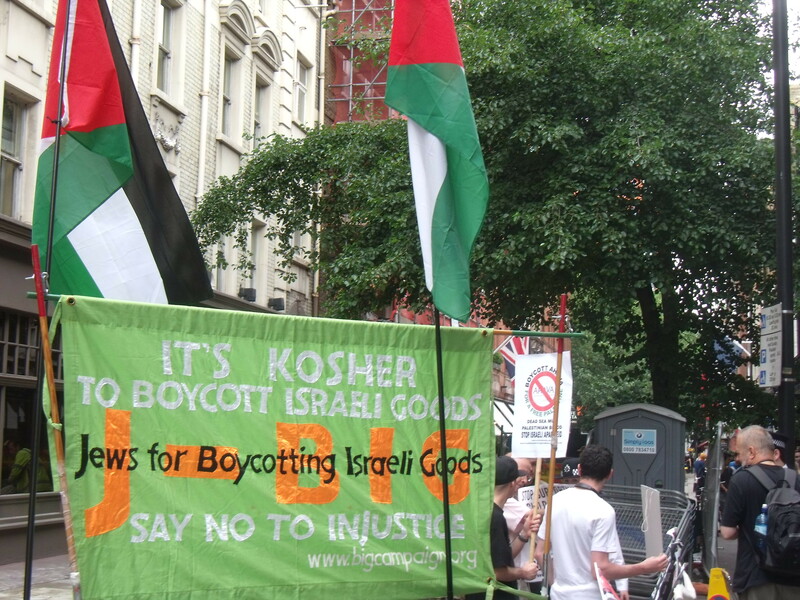 There were about 12 pro-Israel counter-demonstrators in all, one of which was from Turkey, which goes to show that not all Turks are following the Islamist line of Prime Minister Erdogan. Erdogan has, of course, allowed highly anti-Semitic programmes to be broadcast on Turkish television and sees great benefit to himself and his Islamist party, AKP, in stoking hatred of Israel in Turkey. 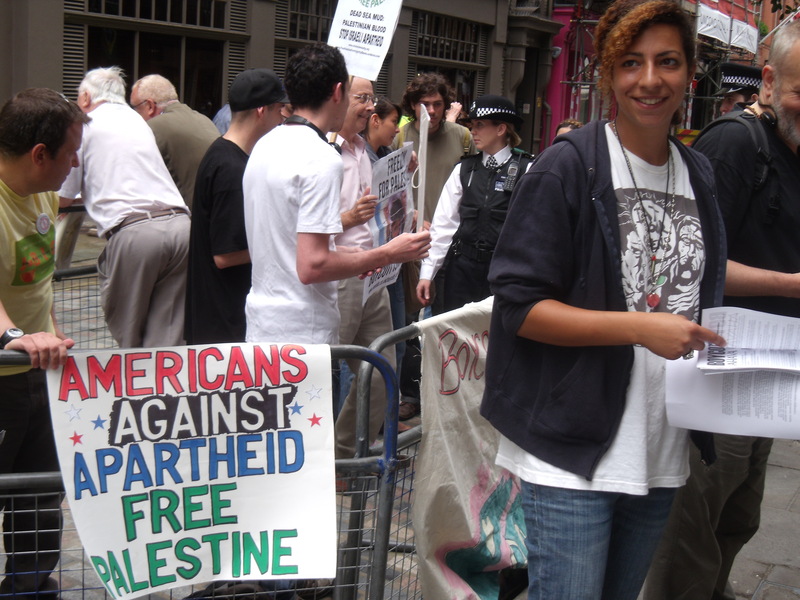 The counter-demonstrators were also joined by someone who had recently chosen to do charity work in Deheishe, a Palestinian refugee camp in Bethlehem on the West Bank, but was subjected to quite a terrifying ordeal during her short stay there. 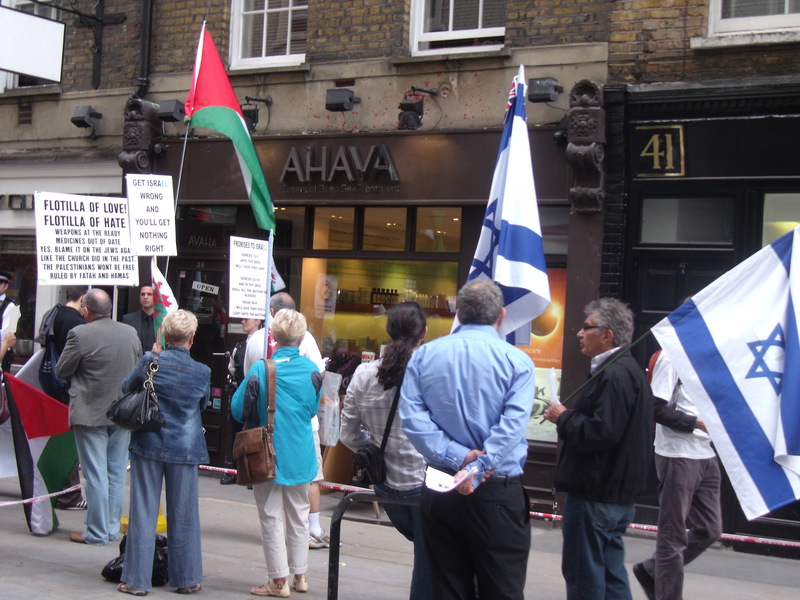 It does seem, however, that as more and more neighbouring shops feel the effects of the noisy anti-Israel protests it is Ahava that is being blamed, with the possible knock-on consequence of Ahava’s landlord refusing to renew the lease at the end of its current term. 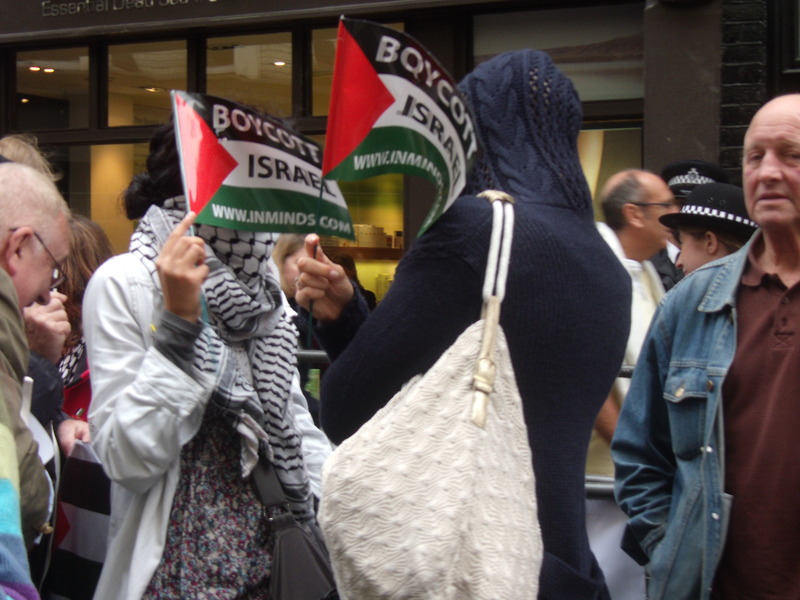 The police have no powers to limit the numbers or noise of the anti-Israel protesters or their taunting of innocent shoppers. 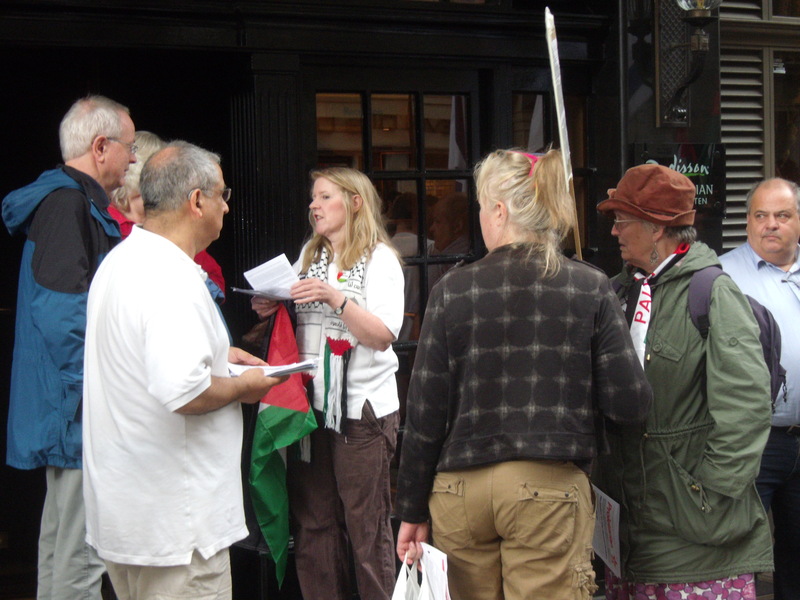 If these protesters are so concerned about Israel’s policies they should do what other people do when they have issues, speak to their local MP. Taunting innocent bystanders and causing nearby businesses to close down is not the way we do things in democratic Britain. 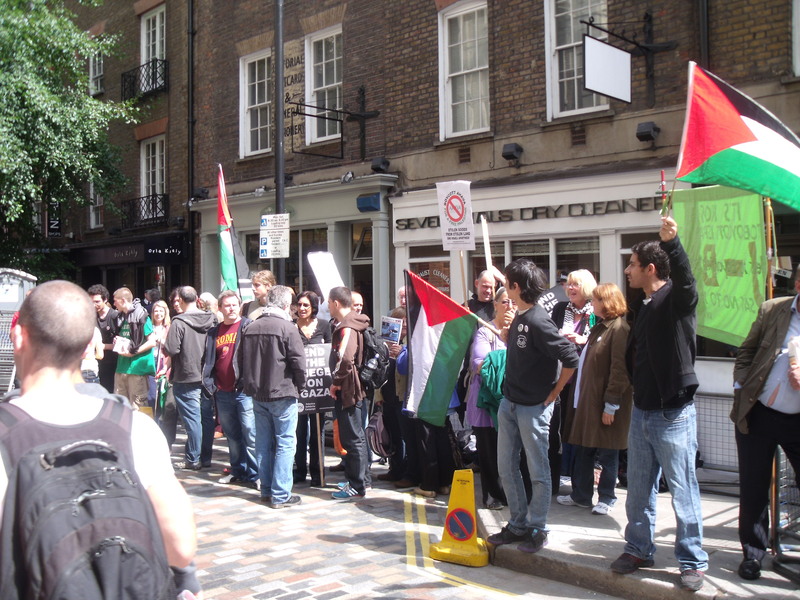 Despite police restrictions on the amount of protesters allowed at the bi-weekly saturday anti-Israel protests outside Ahava in Covent Garden, London chaos reigned as normal. 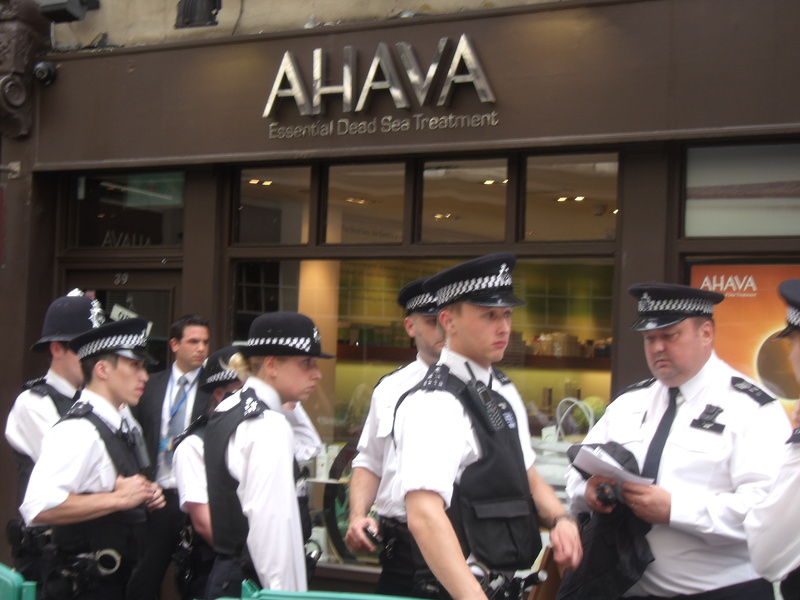 At a specially convened meeting where all sides, including the manager of Ahava and the owners of neighbouring shops, met with the police to discuss ways of minimising disruption to business it was resolved that anti-Israel and pro-Israel activists would be limited to 14 activists each and that noise would be kept to a minimum. 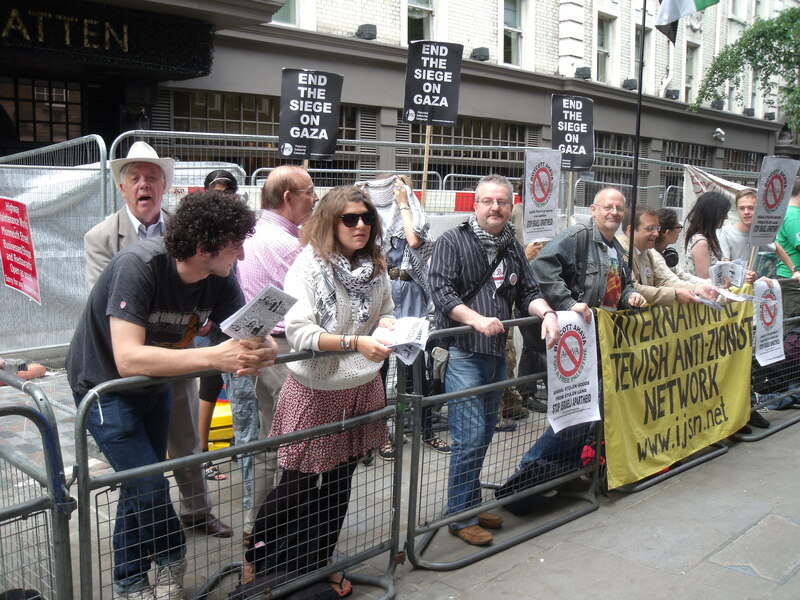 As expected the anti-Israel activists pleaded ignorance of the meeting and turned up in their usual numbers far exceeding the limit. 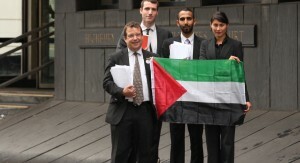 Their confidence was boosted by the recent decision at Hove Crown Court to let seven activists free, on the grounds of “lawful excuse” (they “believed” that Israel was guilty of war crimes in Gaza), even though they had confessed to causing £180,000 of damage to a factory that supplies Israel with military parts. The verdicts were returned after the judge had given an anti-Israel summing up before the jury deliberated. 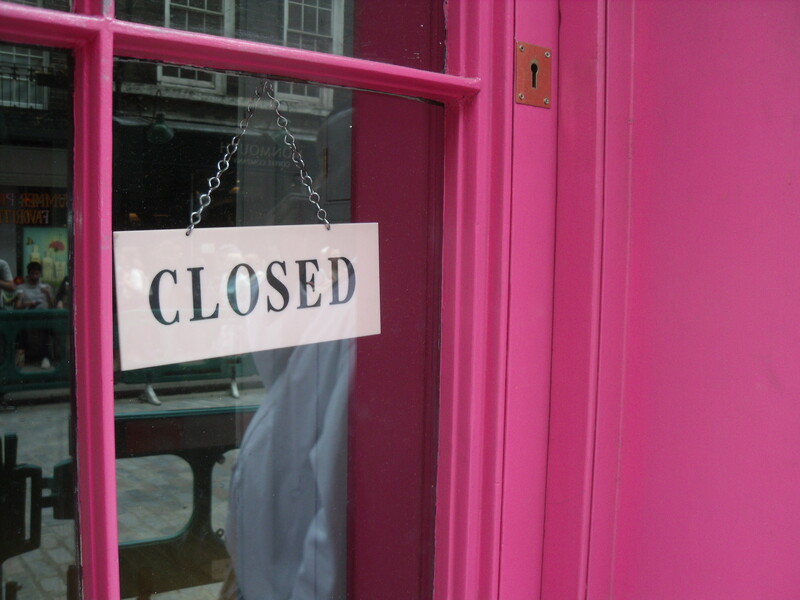 So Covent Garden businesses will continue to lose money due to the disruption caused by the protests (apparently one shop has already gone under). With the precedent of “lawful excuse” excusing £180,000 worth of damage things could go from bad to worse for businesses on Monmouth Street. 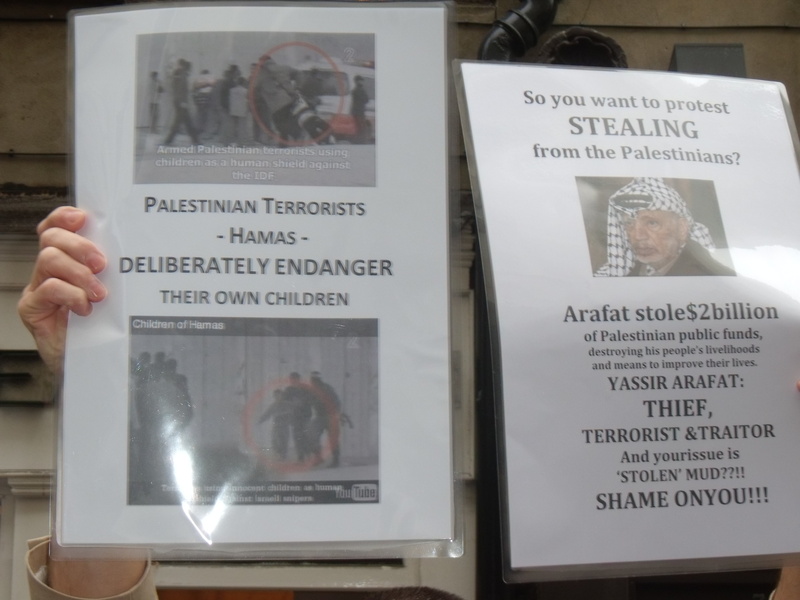 He is a member of the Palestine Solidarity Campaign and has his own business and a family. He feels that Israel/Palestine is the issue of our time. 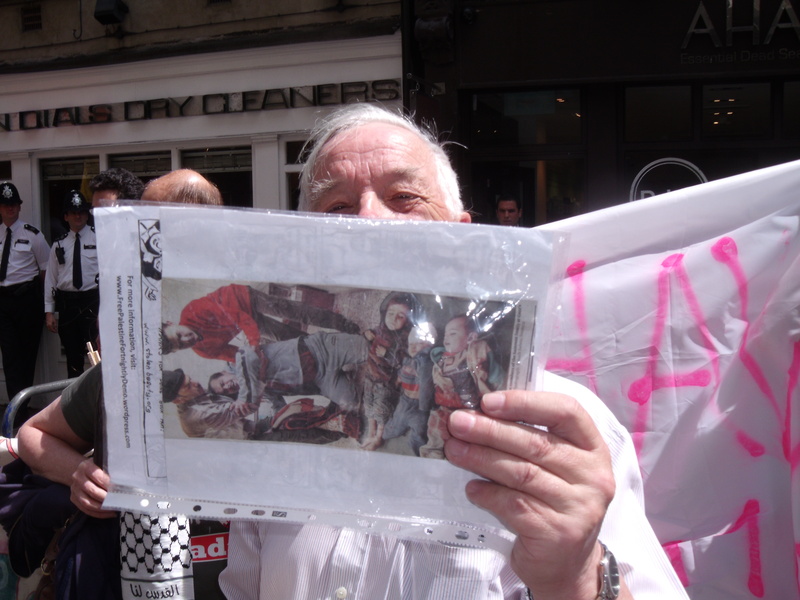 He protested against apartheid South Africa and now wishes to do the same for the Palestinians. All well and good, even if you don’t believe that Israel is an apartheid state. But then he talks about 63 years of occupation which belies his care for the Palestinians. His main concern goes all the way back to 1947, well before he was born. 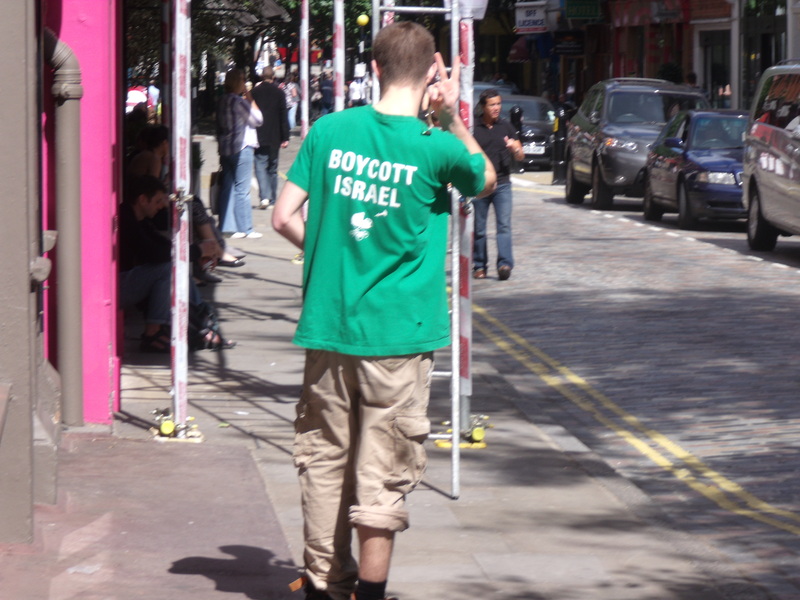 He doesn’t want Israel to exist as a Jewish state and so joins the boycott outside Ahava. But what is most discomforting is that an activist who has his own business and family will quite happily seek to put pressure on another business and its manager and staff who have their own families to feed and all because of his beliefs. 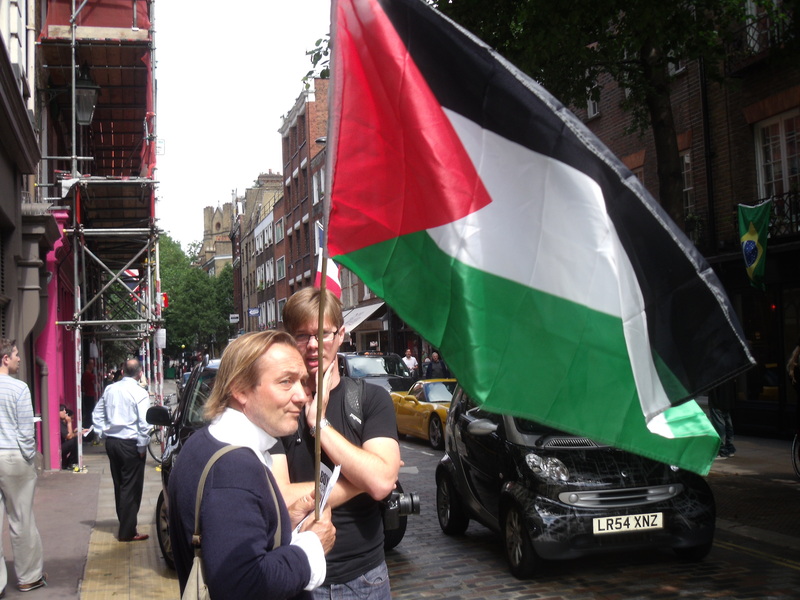 At the beginning of the video of him below you will see Michael who is a fixture at anti-Israel events. 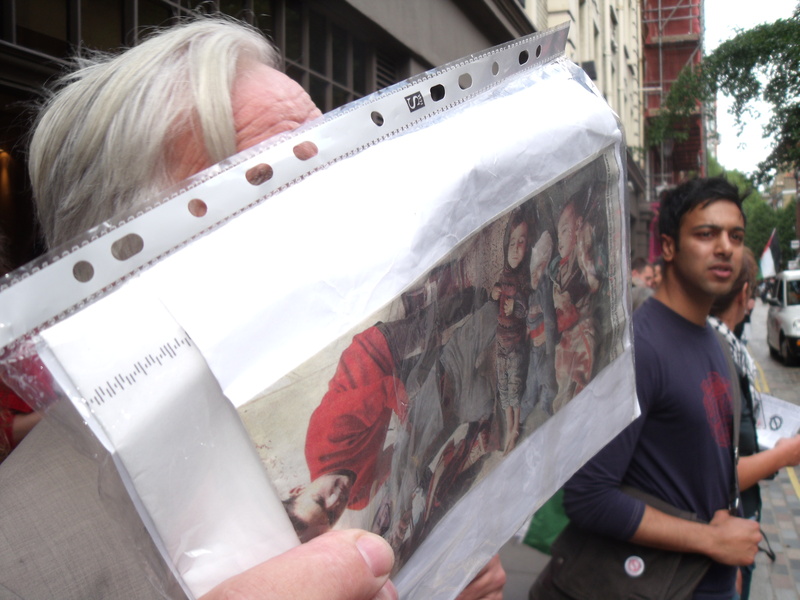 As you can see his repertoire consists of walking around thrusting a photograph of dead children in people’s faces. 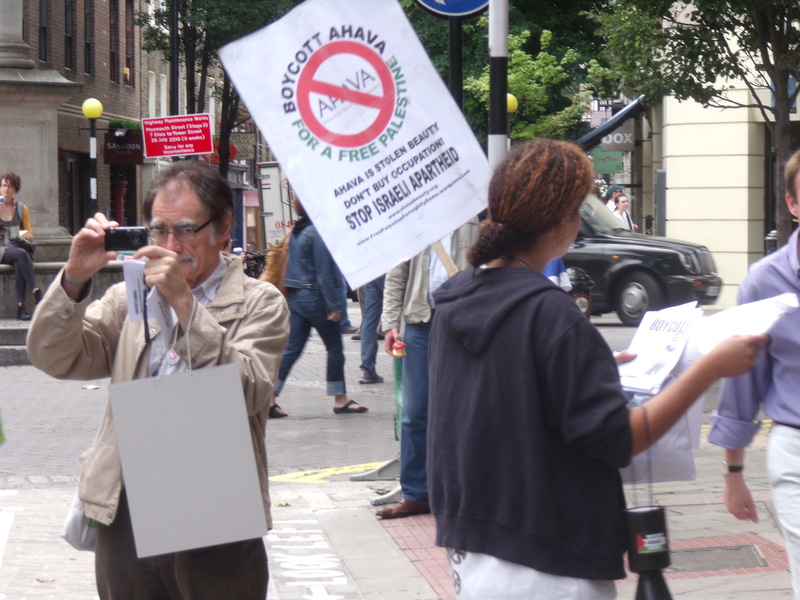 This activist in the footage below is present at every anti-Ahava protest and starts the singing off. No one else has the courage to start the anti-Israel music until she signals. She repeatedly tells me that I must be infatuated with her due to the my camera being constantly on her. I am but not for the reasons that she gives. I am infatuated about understanding why someone is so devoted to ending the Jewish state judging by her song in this footage. Below is Ben. I bumped into Ben in Golders Green recently and we had a very nice conversation. You could almost invite Ben for Shabbat dinner and break bread with him, that is until you see him screaming “From the River to the Sea, Palestine will be free” (see above video also). 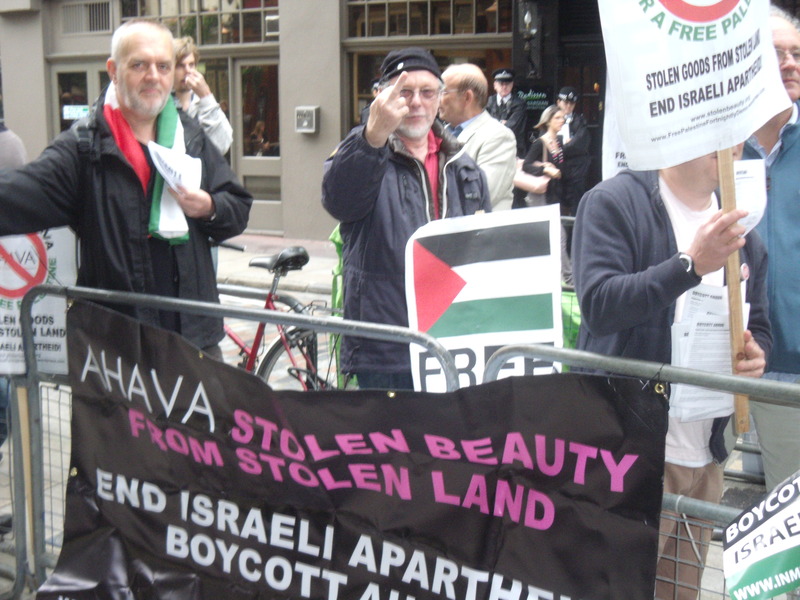 This activist below seems to like to fling himself towards the Ahava shop. He did it again yesterday. With the Hove Seven in mind he might be feeling left out. He seems determined to get himself arrested for the cause. 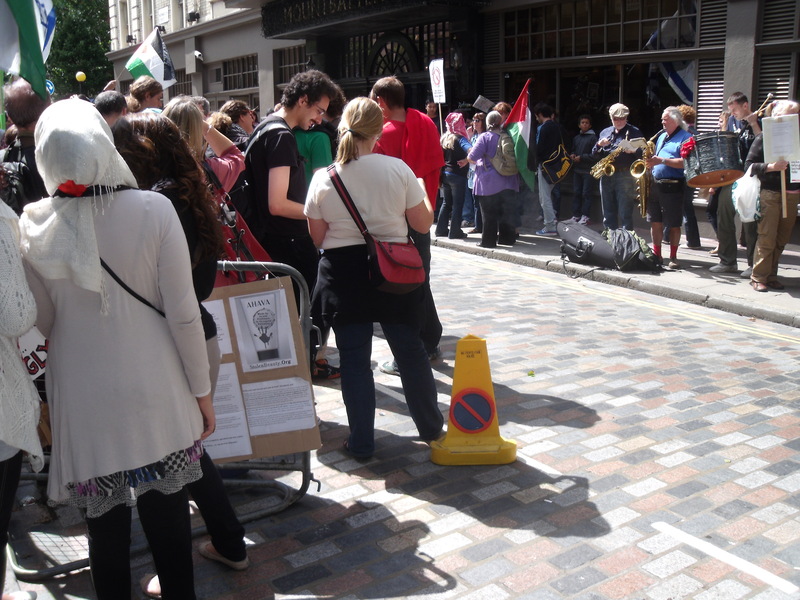 The tiny Jewish anti-Zionist contingent were completely absent from yesterday’s proceedings and this is one thing I do not understand. 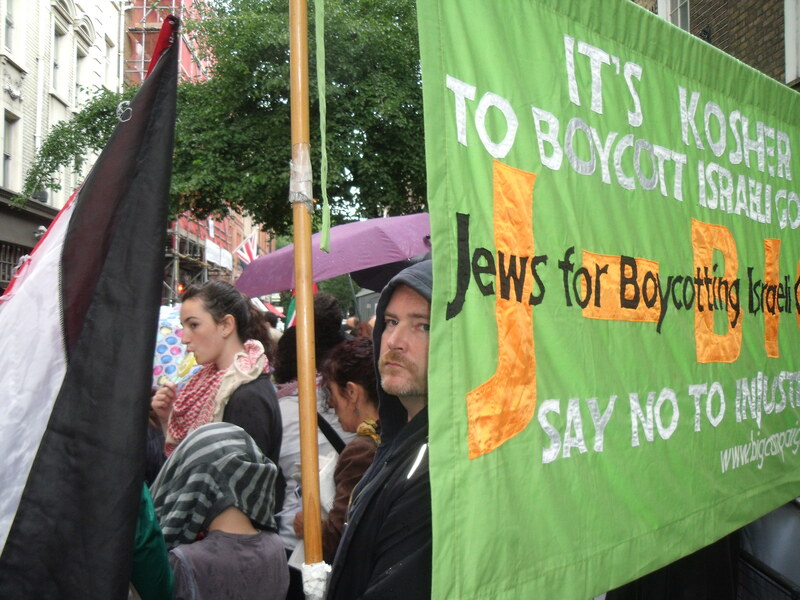 The absence of the yellow IJAN banner didn’t help the other anti-Israel activists who love to point to Jews who are on their side. But surely, if this is the “issue of our time” they would be at every protest as opposed to absenting themselves when the sun shines. Shame on them.